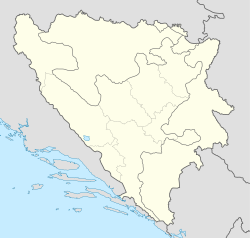 Location of Kladanj within Bosnia and Herzegovina. Kladanj is a town and municipality located in Tuzla Canton of the Federation of Bosnia and Herzegovina, an entity of Bosnia and Herzegovina. Kladanj is located on road from Tuzla to Sarajevo along the river Drinjača, at the base of Konjuh mountain. The first mention of the town of Kladanj dates back to 1138. The first record of Kladanj in Turkish sources is from 1469, referring to the market place Cetvrtkoviste where on Thursdays big fairs were held. In the period of Ottoman rule, Kladanj was mentioned in 1557, as a settlement (kasaba) within the Sarajevo kadiluk (territorial unit) that would further on become a kadiluk itself with Olovo as its part. The land area of the municipality is approximately 325 km2 (125 sq mi). The town is 570 meters above sea level. The lumber industry called "Sokolina" is one of the most vital economic contributors to the municipality. Avdaga Hasić, leader of the local militia "Avdaga's legion"
Senahid Halilović, professor of dialectology and author of "The Orthography of the Bosnian language"
^ jugosfera (29 August 2013). "Kladanj - muška voda". Retrieved 20 April 2018 – via YouTube. Wikimedia Commons has media related to Kladanj. This page was last edited on 27 January 2019, at 10:07 (UTC).